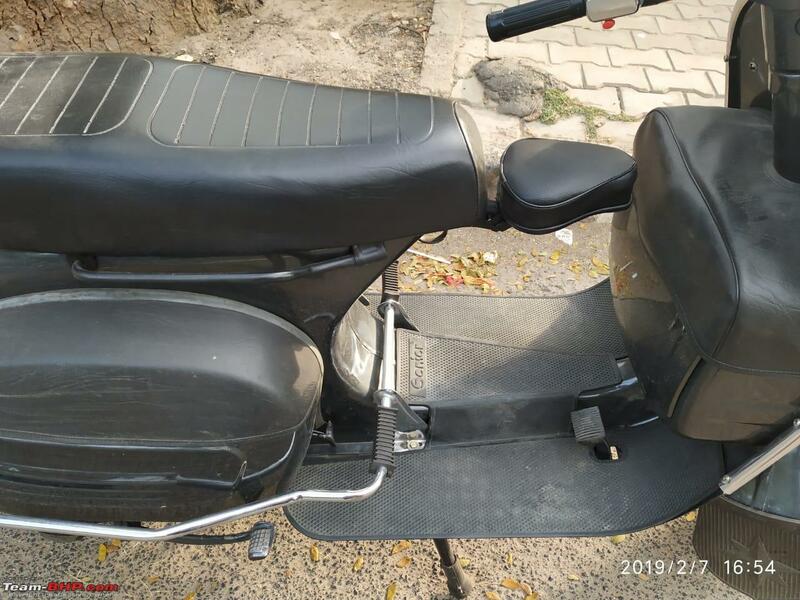 Wow this thread came just in time when I am having similar plans of restoring our 1998 Chetak. It was running fine till 3 years ago, that's when I had to leave to USA for work and I have decided to safely park it under the stairs of my home until I return to India. The last thing I did before leaving my home was to empty the fuel tank and run the engine until the last drop of fuel is consumed, filled the carb with oil to ensure it wont get blocked/jammed. 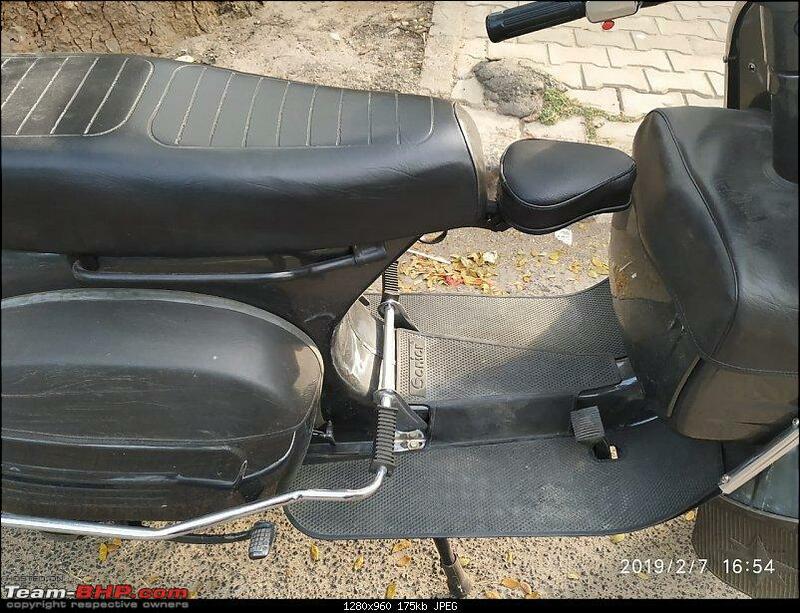 I will be returning to India in couple of months and the first things I would be doing is to get my Chetak running, as it will be my only 2 wheeler in my home town. I sold my 2007 Pulsar 150 while leaving India but decided to keep the Chetak. Wow awesome job restoring her. Here is my dad's baby. 1996 Chetak. Has done 239000km till now. Got the engine overhauled once. Still gives about 45-48km/L. He is so posessive about her that I was not allowed to ride her until I started earning. So happy to read this fabulous story of yours mate! There's a lot of heart and soul with sweat put in your efforts to get the scooter back on road and she's a head turner. 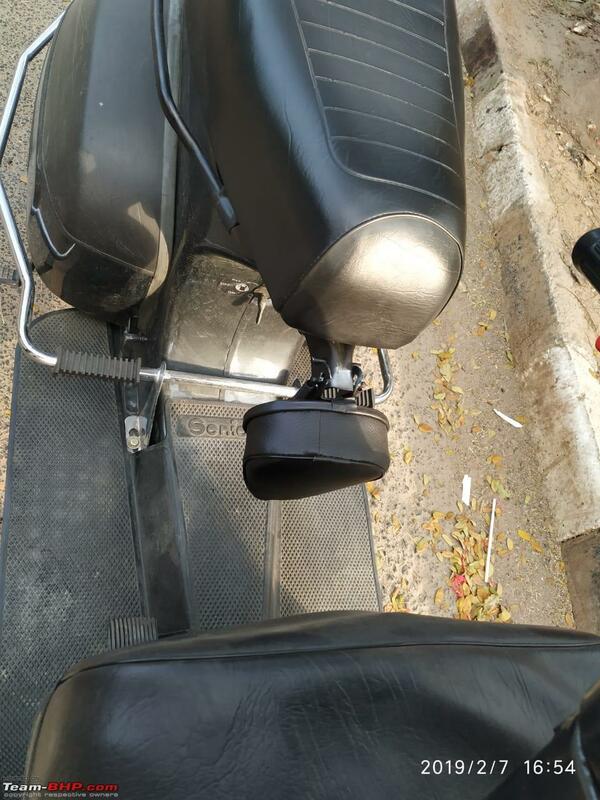 I had gotten hold of a Bajaj 150 a few years ago for restoration but then life took its course and I never collected the scooter back from the mechanic. I rode one of these pretty regularly in 2002-4 in south Andrha along the old Grand Trunk Road in Chittoor district. Great fun flying down that rural, lightly traveled, nicely paved stretch amidst the mango groves, I could hit a speedo-indicated 95kmph with it, it got there pretty quick, and yeah, at that speed the twitchy steering feel made it quite thrilling (especially sans helmet, which nobody seemed to have around there at that time). I remember resisting for a long time the habit of tipping them over for starting, it just seemed ridiculous/impossible from a technical standpoint, and to this day I don't really know why it actually works, but it does! At this point on any given day in India there must be thousands committed to the scrapyard, and I suppose before long, despite how many were sold, they will be rare and collectible. Great machines, with the M800 India's top memory-and-nostalgia-generator for sure. This is just beautiful. How emotions have won over the head is being beautifully portrayed! We had a Chetak too back in the days albeit as a sidecar. Man, that was so much fun. Your thread revived some of those memories. Enjoy your scoot. Drive safe. This brings back memories of my childhood. My father had an even older teal green colored Chetak. So old that I didn't have indicators. I remember climbing on the floorboard and accidentally engaging 2nd gear! Sadly, it was sold way before I could ride. We just wanted to get rid of it for a motorcycle. It was emotional for me to read your great restoration effort. Although I used to had Bajaj Super which was my first scooter purchased by me. I used to travel to my native place from the place of my job which was around 60 km on weekends and back. Alas! it was sold long back. Superb restoration !! This is serious nostalgia. My first two wheeler was a white 1988 Bajaj Super which I rode for 3 years. These two stroke wonders were superb. Wish you happy riding on the Chetak !! Interesting that you point out the higher mileage figures as compared to the current crop of scooters. Shows how even the old 2 stroke engines could give better mileage and yet are condemned for being more polluting. Wish you many kilometers of safe riding on her. Be very careful during the rains- I have managed to skid on a wet road and it wasn’t something I’d like to revisit. Before doing the math, the way it rode, I could make out that it was pretty efficient. I was quite expecting this. Finding a Chetak mechanic isnt difficult. But to have them take a Chetak for service is a big task. Most mechanics want to service the easier and faster Activas/Deos. I have been extremely lucky to find an expert and also who is friendly. Have not named her yet. Will do so soon. That was a nice outing we had and we even rode back in pouring rain mid night. You are absolutely welcome. I have been getting many requests to do a Nandi ride on scooters. Am all game. I somehow failed to communicate the happenings brother. If not, I would have already done this. Would have loved to go tubeless especially. See if you can get it back. There are chances of the Scoot to have got scrapped also. Usually, no one deregisters during scrapping. 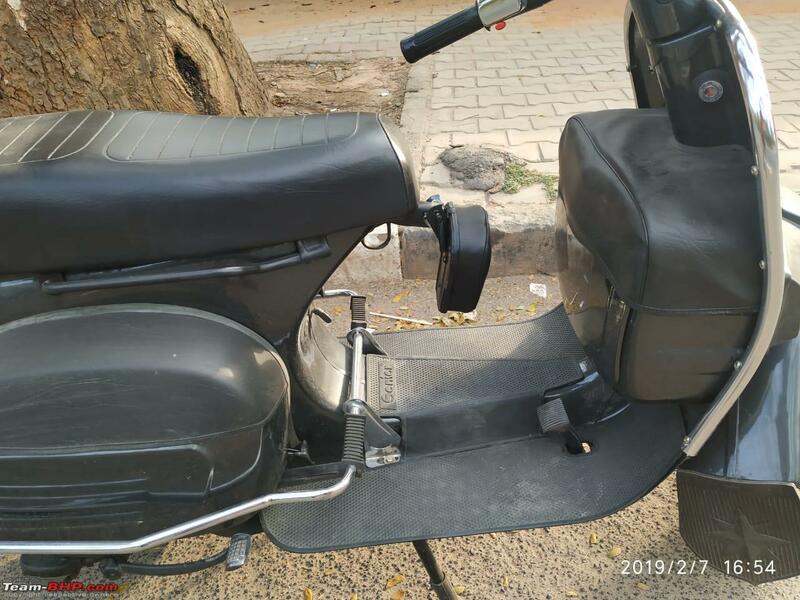 Yes, its literally now or never if one wants to restore their Scoot due to the mounting RTO penalty. Right now itself is unreasonable, except for if one truely loves the Scooter. Good luck! The RTO charges and penalty is same across India. If you serious about it, do it now. Else, the cost will escalate beyond what can be practical. 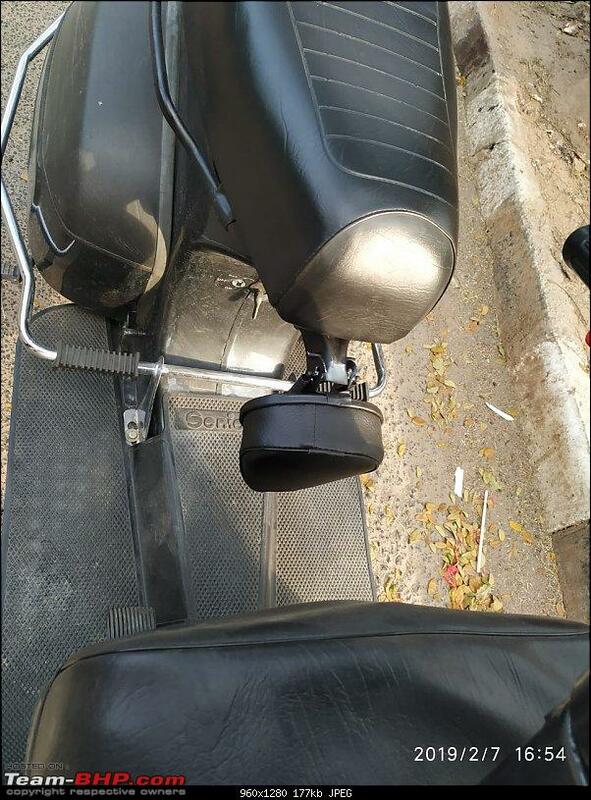 Bajaj who once dominated the Scooter market simply lost the plot when gearless vehicles invaded. It can be a good come back if they came with a gearless Chetak. It is not banned. The fitness got registered, just fine. Only in Delhi 10+ year diesels and 15+ year petrols are banned. Father in law smiled at me and sheepishly asked if I knew how to ride this thing as matter of some hidden pride. 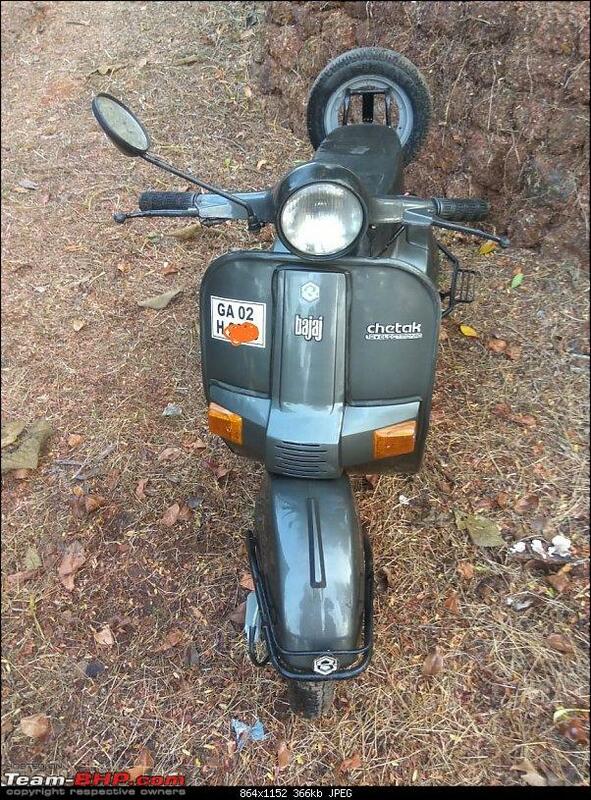 I thanked Chetak and the innumerable time I had to tilt it to start and rode that rusty lambretta away with panache. It saved the day for me. I moved on to Vespa Select II and then to Pulsar 150 DTSi. 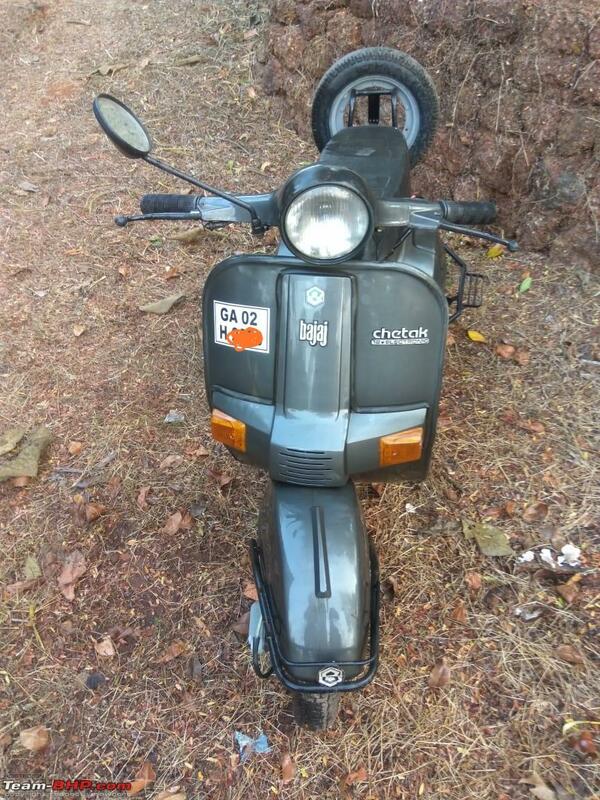 But nothing can recreate the nostalgic feeling as a Chetak still does. I still point out to any sightings of this scooter on streets to connect with my childhood. Ha ha ha! Good one. Nice experiences there mate. Perfectly legal. Fitness is till 2023 now. Whether 2 strokes will be banned? I don't think they can without a solid reason. Great to know. Count on me for anything I can be help for. Too good. Wish you best of luck in maintaing this beauty. He he! As long as you do justice to it. Mine does such speeds. On GPS, the fastest recorded speed was 81kmph though. I dont know if it could go beyond this speed. As a kid, I always wished we should have had a Scooter with side car. Its literally impossible to find a good Scooter with side car. I doubt if RTOs would be willing to endorse a side car now even if any one made it. Do you have pictures of it? Amazing thread both in terms of the vehicle in question and the efforts that you have put in to bring it back to life. It's going to take multiple readings of this thread for me to squeeze out all the learnings. Incidentally, my association with Chetak goes back a long way too. Have sent you a PM with a link. I was totally ecstatic and simply loved the way it appeared. I fell in love with the scooter again and again. By this time, it was not only love but I was OBSESSED! I simply couldn't wait for the work to get completed and go for a spin. Thank you Karthik, for making many of us rewind to our past - those ever superb school days! Same here. Actually, even before I came to your post, I had pinged VAHAN to see the ownership of my dad's Green-colored Chetak. Unfortunately, I got a reply stating that the Vehicle Details are not found. 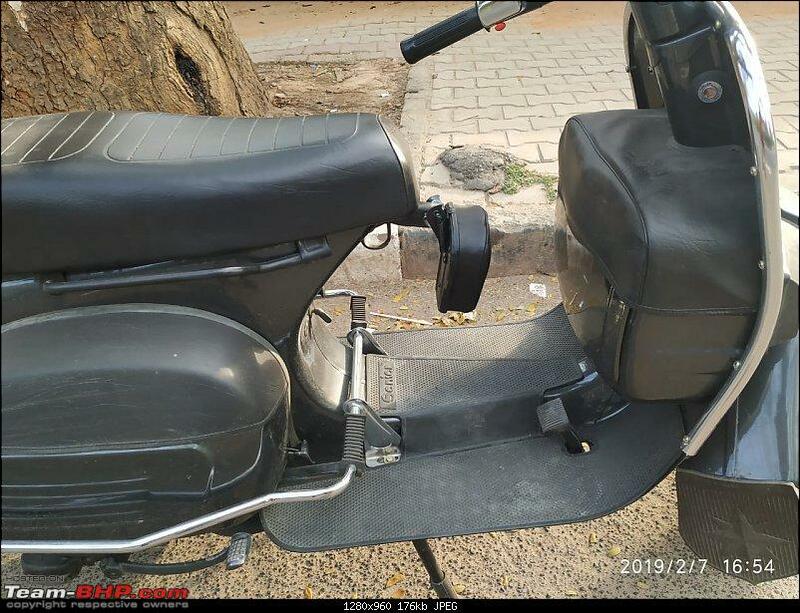 My dad had bought the scooter (TN23Z4020) as a pre-worshipped one when I was in my 4th std in 1992-93 (if I remember correctly, from a vet doctor) and even then, it was almost brand new (less than a year old and very few kms covered). It was the first ride that my dad owned. Prior to that, he had a office-provided Rajdhoot. My dad and his brother (who also had a Chetak - cream colored) rode it from Arcot (near Vellore) where the scooter was bought all the way to Chennai. A distance of around 130 kms which was a big deal back then. My dad's other brother owned a Bajaj Cub - which was a smaller version of Chetak. 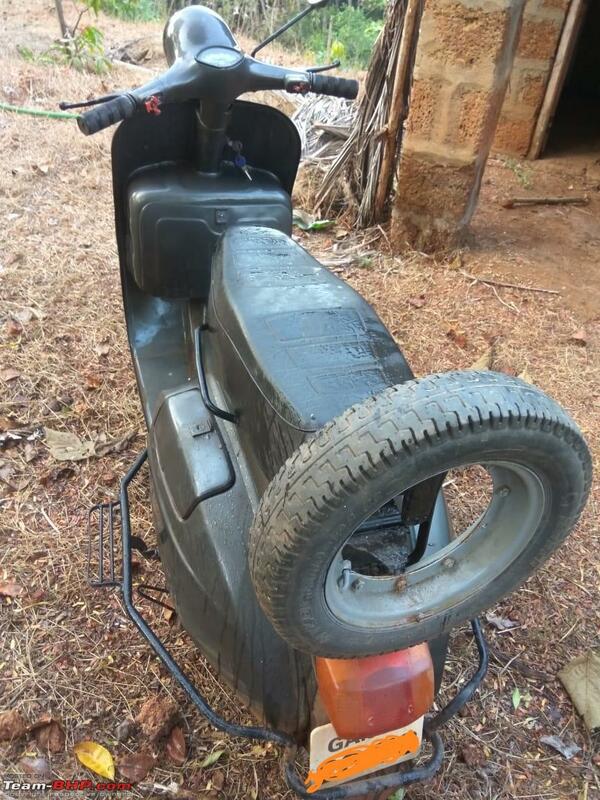 Unlike many photos posted here, the scooters that my dad and my uncles owned (2 Chetaks & 1 Cub) were double seated scooters (2 separate seats and the petrol tank-lid in between. It was the first geared-vehicle that I ever rode. Gradually, I graduated riding geared bike/scooter in that and used to take it to my school (in 2000-01). Later on, being a college-goer, I lost interest in the scooter and would ride bikes. When my dad got another office-provided bike (the Hoodi Bhabha Caliber, he sold the scooter off for some paltry sum. As you age, you become wiser. I now realize how I miss that scooter. Last edited by callvvijay : 7th February 2019 at 15:51. As a kid I always wanted my dad to install a child seat. He did not install one and made me understand the cons of. It reduces the space, fouls with the front dickey, also accessing the hook below which was used very frequently for carrying utilities would be difficult. Now that I dont really use it as a work horse, I have the liberty of doing so. I thought why not do it for my 20 month old daughter. I searched several places in vain and finally got hold of one. I visited the seat cover shop and asked them to add a seat cover too. I had my mechanic install it. It wasnt an direct fit. 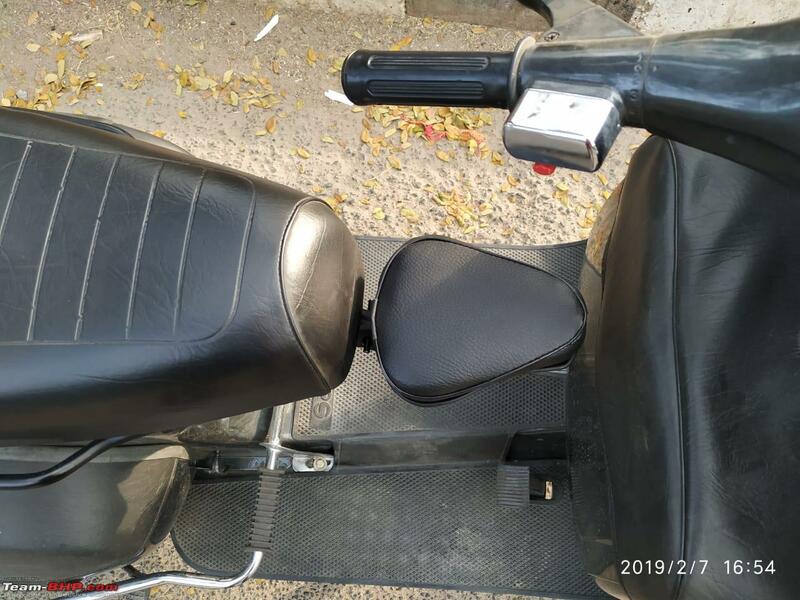 Some jugaads were to be made to align the sear clamp with this seat. Finally it was installed and I took my daughty for a spin yesterday night. She was super excited. It was also her first time where she independently sat on a scooter. All these days, I used to take her in baby carry belt strapped to me or my wife would hold her at the back. Unfortunately, I couldnt click any pics of my daughter sitting on the seat as it was night and I was alone. I couldnt muster the courage of making her sit there and click a pic as it was her first time. While riding its fine as she would be sitting in a position where my knees feel protective support to her. Here are the pics of the baby seat after installation. Hats-off for the passion you had in the vehicle and time taken to get it stream lined. The new look is amazingly awesome and reflects your efforts. If you don'd mind, I am eager to done to know the overall cost incurred in this exercise. Aahh, Good old days of the Scooters . My Dad had a Bajaj Chetak. I learned riding 2 wheelers on a Bajaj Priya. My Father in law still owns a Bajaj lying in a corner of his small maintenance room with blanket of dust. Believe me every time I visit my in laws, the thought of restoring the scoot crosses my mind. But in laws living far away and with my limited leaves, the project is still a distant dream. All times are GMT +5.5. The time now is 14:26.